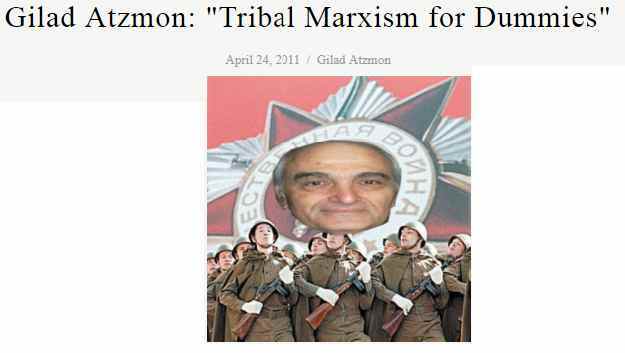 Pictured here is Israeli Marxist Moshe Machover - Atzmon has developed a unique concept of Jewish as opposed to non-Jewish Marxism! When I challenged him on this passage Atzmon retorted that this essay had been integrated into his book The Wandering Who and if it had suggested Holocaust denial then ‘the book would’ve been banned and I’d have been arrested” when he set foot in Germany since Holocaust denial is illegal there. What Atzmon omitted to say was that everything before ‘65 years after the liberation of Auschwitz..’ had been omitted from the book! In 2005 Jews Against Zionism held a picket outside the SWP’s Bookmarx shop when Atzmon was invited to speak to the collective faithful. 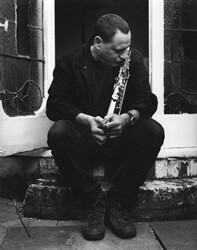 I have published a number of articles on Atzmon such as Guide to the Sayings of Gilad Atzmon and Time to say goodbye. In mid-July Tony Gosling, who hosts a community radio station in Bristol invited me to debate Atzmon for the first time on a programme. 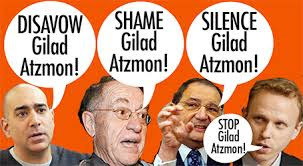 Despite finding it difficult at times to hear everything he said, it was clear why Ali Abunimah, Omar Barghouti, Professor Joseph Massad and many other Palestinians had issued a joint statement Granting No Quarter: A Call for the Disavowal of the Racism and Antisemitism of Gilad Atzmon six years ago. (see below for statement). Atzmon’s paints all those who are what he calls politically Jewish as one and the same. To him, regardless of whether your are an anti-Zionist or a Zionist if you are what he terms politically Jewish you are all the same. 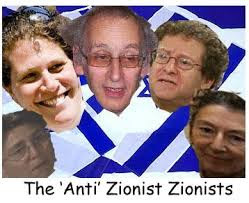 He takes particular exception to Jewish groups which are formed to oppose Zionism. This is apparently a specific example of Jewish supremacy. Atzmon is one of those few anti-Semites who opposes Israel, not because it is a settler-colonial state but because it is Jewish. Historically most anti-Semites supported the idea of a Jewish state as it was an ideal place to send all their unwanted Jews. Throughout the debate Atzmon insisted that he cannot be anti-Semitic because he never mentions the word 'race', even though he consistently accuses anti-Zionist Jews of being 'racially oriented.' It is clear to me that if you assert that all Jews are Zionists, i.e. politically the same, because they are Jewish, then you are invoking an anti-Semitic stereotype which says that all Jews share the same beliefs and opinions because they are Jewish. It is clearly as assertion of race by any other name. By contrast, I really do not understand those who fight Zionism in the name of their secular Jewish identity. I have never understood them. I have never really understood what secularism means for the Jewish people.... To demand that Jews disapprove of Zionism in the name of their Jewish identity is to accept the Zionist philosophy. To resist Zionism as a secular Jew involves an acceptance of basic Zionist terminology, that is to say, a surrendering to Jewish racist and nationalist philosophy. 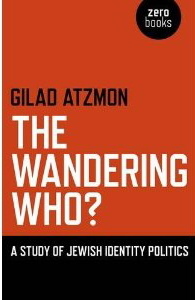 As Atzmon conceded in the debate, Jewish identity is not and never has been fixed. The idea that Jewish identity can only take the form of Zionism or Orthodox Judaism is an essentialist view of what it is to be Jewish. 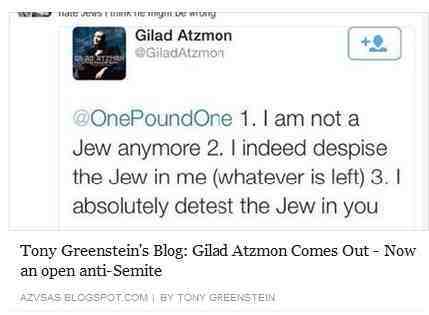 In stating that to be Jewish is to be a Zionist Atzmon mirrors what Zionist ideologues themselves say. To say, as Atzmon says above that to oppose Zionism as a Jew is to accept basic Zionist terminology only makes sense if you accept that being Jewish and Zionist are interchangeable. Jews are now more than welcome in Germany and in Europe, yet, the Jewish state and the sons of Israel are at least as unpopular in the Middle East as their grandparents were in Europe just six decades ago. Seemingly, it is the personification of WW2 and the Holocaust that blinded the Israelis and their supporters from internalising the real meaning of the conditions and the events that led towards their destruction in the first place. In an interview with the New Statesman, the house journal of the Labour Right and the anti-Corbyn campaign, former Chief Rabbi Jonathan Sacks engaged in a piece of vitriol worthy of Goebbels himself. 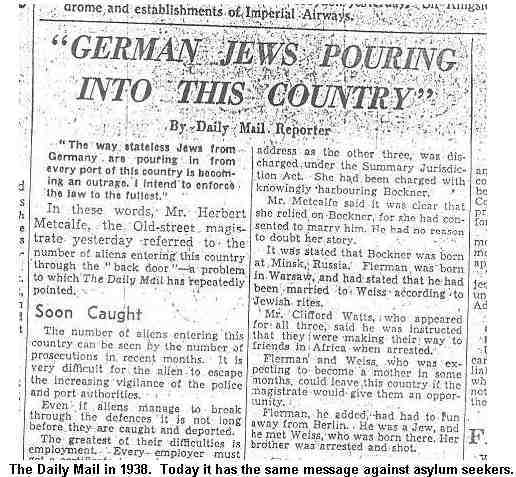 Not surprisingly, the Daily Mail, which in the 1930’s campaigned against the entry of Jewish refugees from Nazi Germany to Britain and which latterly employed Katie Hopkins as its columnist, cheered him to the rafters. The Mail quoted Sacks as saying that Corbyn’s criticism of Richard Millett, an open fascist, ‘was the most offensive remark by a British politician since Enoch Powell's Rivers of Blood speech in 1968.’ Outrageous and absurd hyperbole seems to be the Zionist substitute for anything approximating to rational thought and polemic. 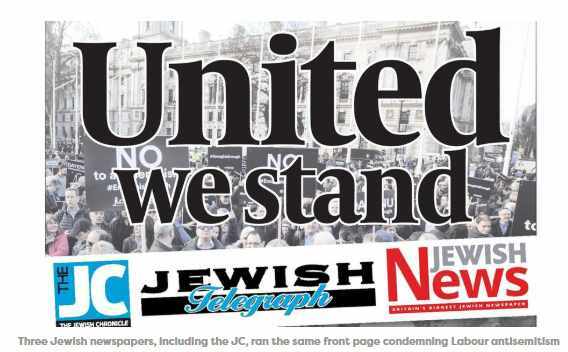 Less than a month ago, Britain’s 3 Zionist papers published a joint editorial which spoke of ‘ the existential threat to Jewish life in this country that would be posed by a Jeremy Corbyn-led government’ with barely a murmur from rational people. An existential threat literally means a threat to someone’s life. 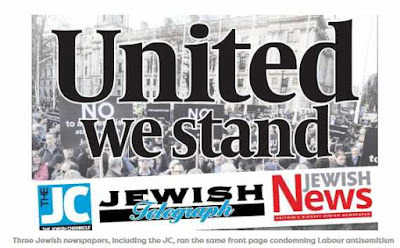 What these 3 propaganda rags were saying was that Corbyn was literally a threat to the Jewish community along the lines of Adolf Hitler. Presumably under a Jeremy Corbyn administration the British version of Auschwitz would be opening its doors for business. And then these Zionists complain about comparisons between Israel and Nazi Germany and via the IHRA denounce those who make such a campaign as ‘anti-Semites’. 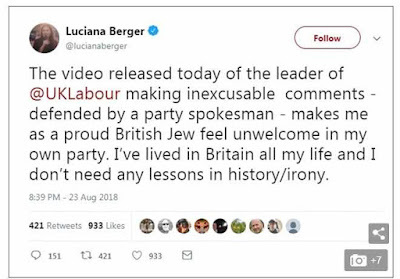 Of course given that the Blessed Margaret Hodge of child abuse fame compared the threat of disciplinary proceedings to the experiences of her father who fled the Nazis, it would seem that exaggeration and hyperbole are the main fare of Zionism these days. 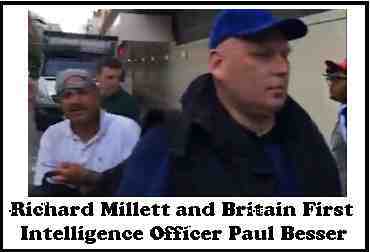 It would seem that in their defence of the State of Israel, British Zionists have lost all sense of proportion. The idea that someone who was arrested outside South Africa House protesting against Apartheid has now become an SA stormtrooper is too silly for words. However this is understandable. 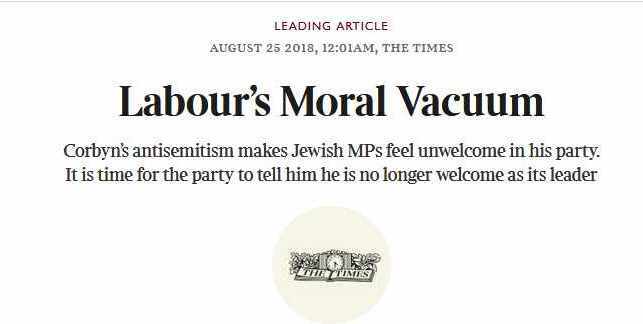 How else do you defend a state where Arab life is cheap, where Arab homes are demolished to make way for Jewish homes and where Arab and Jewish are segregated in maternity wards if not by demonising your opponents and engaging in the type of abuse that would be better suited to Smithfields market? It says a great deal about Zionist intellectuals that they have to get down into the gutter in order to defend the racist Rottweiler that is the Israeli state. 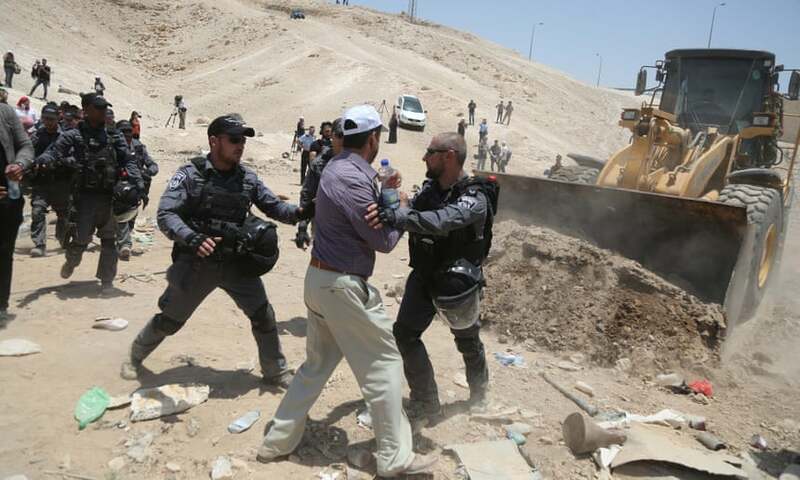 This is the reason for Jonathan Sack's libellous attack on Corbyn - how else do you defend Israeli Police helping the bulldozers to demolish a Palestinian village unless you attack your opponents as 'antisemitic'? Pfeffer added that such a belief showed “a disconnect bordering on hysteria … not only are they woefully ignorant of recent Jewish history but have little concept of what real anti-Semitism is.” Which just about sums up Jonathan Sacks too. 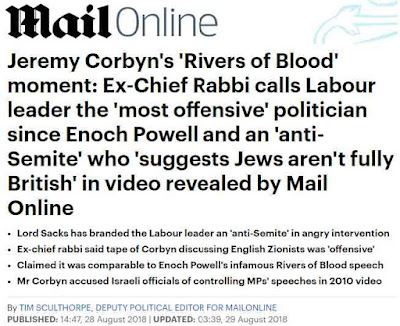 Jonathan Sack’s comparison of Corbyn with Enoch Powell is not only extraordinarily offensive but it is in itself anti-Semitic. What he and the rest of the empty chorus of Zionist propagandists are doing is to belittle and minimise the experience of Jews who in the past faced real anti-Semitism. To compare opposition to Zionism and Israeli Apartheid with anti-Semitism simply minimises and trivialises the bloody pogroms of Czarist Russia to say nothing of the tribulations of German and European Jewry under Nazi occupation. 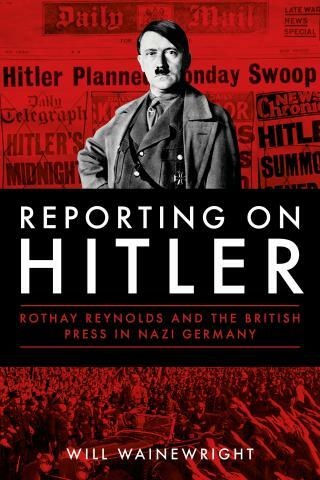 It is somewhat ironic that the Zionist movement which never fought anti-Semitism and in the case of Nazi Germany actively collaborated with it now dons the mantle of the opponents of anti-Semitism. My dad fought in the Battle of Cable Street, a battle that the Board of Deputies explicitly told British Jews to stay away from. They and the English Zionists told Jews to avoid the fascists and keep their heads down. They repeated this in the 1970’s in the fight against the National Front. The reason Zionism has never fought fascism or anti-Semitism is because it shares too much in common with anti-Semitism to ever fight it. As one of Israel’s foremost novelists and poets, A B Yehoshua observed ‘even today a real anti-Semite must also be a Zionist.’ Both agree that Jews ‘real home’ is not where they are living but in Israel. Sacks then drew the conclusion from these throwaway remarks that Corbyn had threatened ‘the existence of an entire group of British citizens by depicting them as essentially alien.’ Now Sacks is an erudite fellow with a clutch of degrees. For him to make cheap and populist remarks like this, in order to gain the plaudits of the right-wing anti-immigrant British press (and the BBC of course) is a measure of how Zionist intellectuals will prostitute their talents for the sake of Zionism and petty nationalism. This is a measure of how far Zionism will go as it debases the currency of political debate. 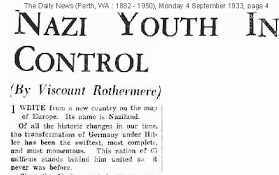 Jeremy Corbyn was referring to a couple of far-Right British Zionists not Jews. He never mentioned their religion. It was entirely irrelevant to him. The whole of Sack’s intellectual edifice is based on this assumption, an assumption that is the staple diet of Zionism, that being Jewish means being a Zionist. Corbyn however made his position quite clear. In a statement to the Guardian Corbyn said he had used the term Zionists “in the accurate political sense and not as a euphemism for Jewish people”. He also added: “I am now more careful with how I might use the term ‘Zionist’ because a once self-identifying political term has been increasingly hijacked by anti-Semites as code for Jews.” On this Corbyn is wrong Anti-Semites tend to do this less and less now. It is Zionists who insist on conflating Jew with Zionist and then drawing the conclusion that to be a Jew is to be a Zionist. It is not for nothing that the most virulent anti-Semites, like the neo-Nazi founder of America’s alt-Right, Richard Spencer, defines himself as a White Zionist. Nor is Spencer alone. Think of any major far-Right or neo-Nazi political leader or movement in Europe today and almost without exception they are pro-Israel and pro-Zionist. 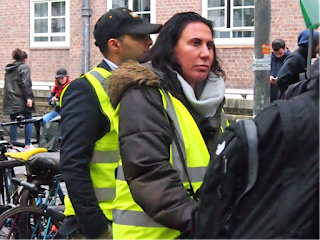 Le Pen, Strache, Geert Wilders, Alternative for Germany, Matteo Salvini – today’s far Right are focused on Muslims and in the process they too have become philo-Semitic. Sacks is one of the few erudite rabbis in Britain, certainly in comparison with his almost embarrassing successor, Ephraim Mirvis. It is a sad commentary on the corrosive effects of Zionist nationalism that it makes Philistines out of otherwise learned Jews! Nothing is more contemptible than seeing an intellectual like Jonathan Sacks lower himself in order to make cheap and demagogic points and play to the populist crowd. That is precisely what Enoch Powell, a classics scholar did with his Rivers of Blood speech. Ironically if anyone resembles Enoch Powell it is Rabbi Jonathan Sacks himself. Rabbi Sacks, Why Are You Cheerleading for anti-Palestinian Provocateurs? Growing up in Bnei Akiva in the UK in the 80s and 90s I was entirely ignorant of the occupation. There were no dotted lines on our maps of Israel, no Palestinians seeking self-determination, only millions of hostile Arabs wanting our land. Supporting Israel meant supporting Israel’s control of the whole land; I knew of no other option. Through such education the occupation was normalized for many Orthodox British Jews of my generation. It is common even now in both formal and informal settings to reject the use of that word to describe the situation in the West Bank. This environment enables Rabbi Jonathan Sacks, former Chief Rabbi of Great Britain, member of the House of Lords, a high-profile member of both Yeshiva University and New York University’s faculty, and one of the most eminent modern Orthodox rabbis of his generation, to extend a “personal invitation” to Diaspora Jews to join him on a trip to Israel which includes “leading” the March of the Flags on Jerusalem Day and “dancing with our brave IDF soldiers” in the radical settler enclave inside the city of Hebron. The trip, marking the 50th anniversary of the reunification of Jerusalem, is run by Mizrachi Olami, the parent organisation of Bnei Akiva. The March of the Flags, which celebrates the reunification of Jerusalem, passes through the Old City’s Damascus Gate in East Jerusalem and proceeds through the Muslim quarter. In his promotional video for the trip Rabbi Sacks quotes Psalms: “Jerusalem is rebuilt like a city that is compact together” and goes on to say, “of course that’s what we see each time we visit Jerusalem today”. 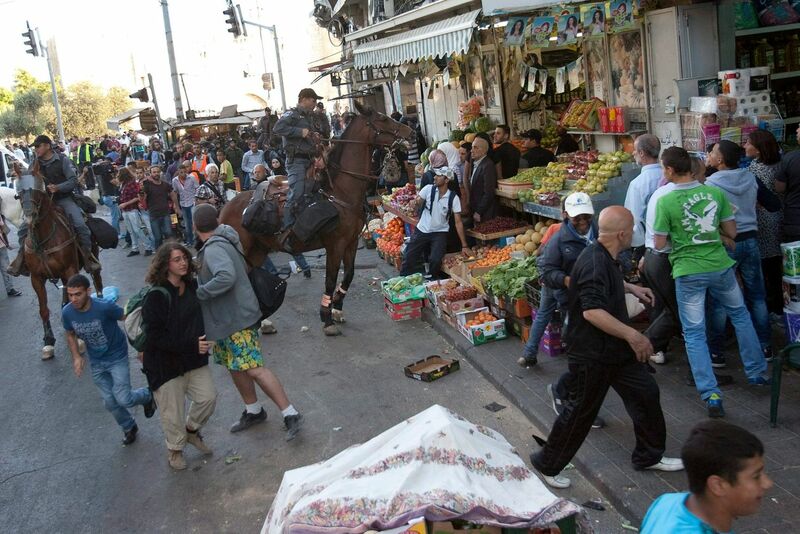 The Israeli authorities enable this wilful blindness to the reality of a divided city by issuing closure orders to Palestinian businesses along the route, and preventing Palestinian residents from being on the streets. 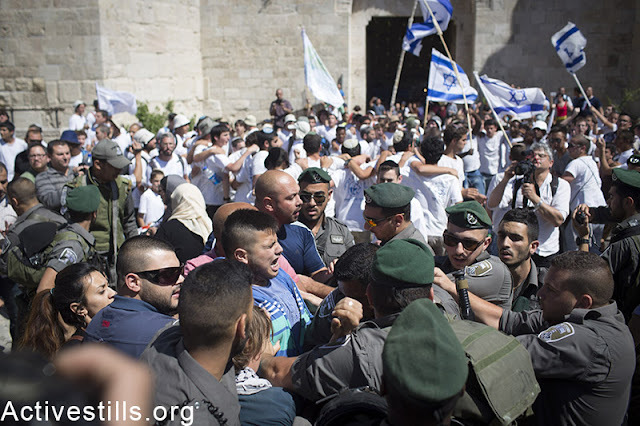 On their trip to Hebron, as well as praying at the Cave of the Patriarchs, the group will visit one of the most contentious of all the settlements. 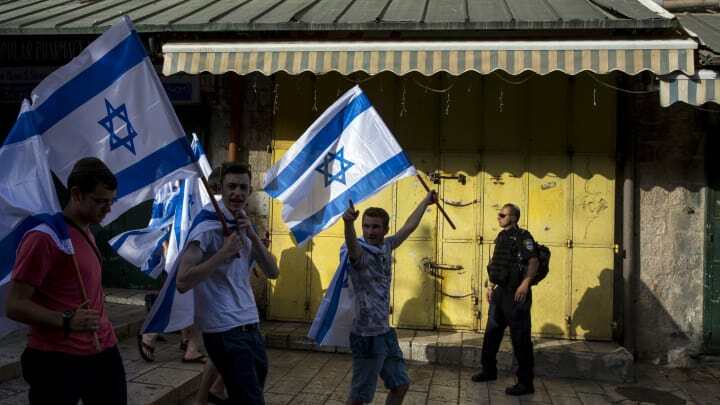 It comprises a few hundred Jews in the centre of a city of 150,000 Palestinians, heavily guarded by the Israeli army and causing huge ongoing disruption to the Palestinian population. ‘Dancing with soldiers’ in the streets of this settlement enclave is an unequivocal show of support for the settlers’ presence there, and of disregard to local Palestinians living under a form of perpetual siege. The Western Wall and the Cave of the Patriarchs were inaccessible to Jews between 1948 and 1967. 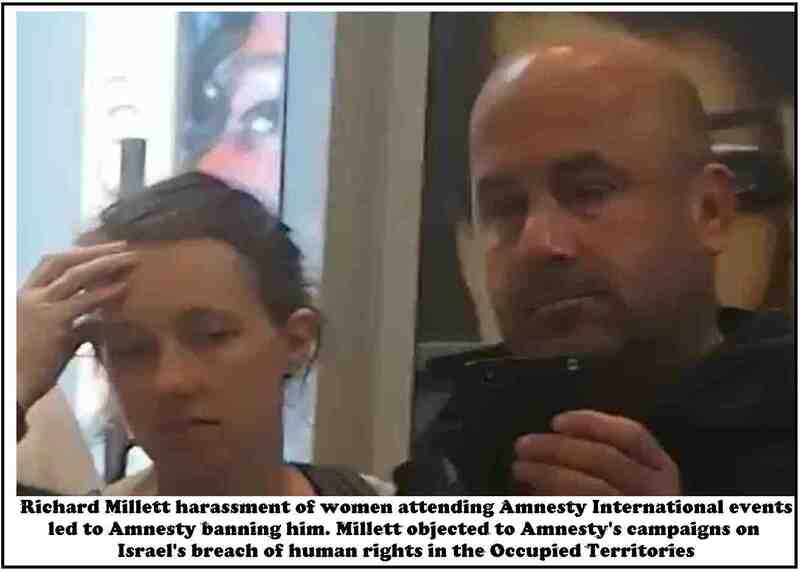 Celebrating renewed Jewish access and praying at these holy places is understandable; however Mizrachi’s planned activities venture beyond celebration into highly contentious territory and provocation, mixing political acts with religious celebrations. The trip aims to tacitly reinforce the same lesson I was taught in my youth: that supporting Israel’s presence in the entire land is an intrinsic and necessary part of supporting Israel. It is surprising that Rabbi Sacks is promoting this trip. His most recent book, Not in God’s Name, discusses the importance of interpreting religious texts and obligations in a way that is consistent with peace and tolerance. He has earned a reputation for being thoughtful, measured and conciliatory. Last year he won the prestigious Templeton Prize in recognition of his appreciation and respect towards all faiths, for promoting the importance of recognizing the values of each of them, and for his inter-faith work. In a 2002 interview Rabbi Sacks expressed serious concerns about the occupation, remarks for which he was much criticised by some in the Orthodox community. For Rabbi Sacks and other religious leaders to endorse the message that to support Israel must require supporting the occupation, and some of its most radical settlers, has serious consequences. Many in the Diaspora accept this message, impeding real dialogue about how we can best support Israel, and about the plurality of views. Others see how Judaism, Zionism and the occupation are being presented as an indivisible whole and reject the former as well as the latter, at great cost to our community. To the wider communities in which we live, the promotion of these events by one of the world’s most respected rabbis sends a message of normalization and acceptance of the occupation by the mainstream Jewish community. Many Jews in the Diaspora work hard to emphasize that being Jewish is not synonymous with supporting the Israeli government, and that supporting Israel’s right to exist is not synonymous with supporting the occupation. Rabbi Sacks’ actions risk undermining these messages. A group of British Jews currently living in Jerusalem has prepared an open letter to Rabbi Sacks, expressing our concern at the implications of his trip on Diaspora communities, and asking that he reconsider his involvement in these events. We hope that together we can work towards a more honest dialogue about Israel, one in which we directly engage with the occupation rather than airbrushing it out. I often meet Jonathan Sacks, the former British chief rabbi, for lunch. He just doesn’t know it. I eat at my desk while watching one of his ten-minute lectures on the weekly Parsha on YouTube. Sacks’ erudition—not just about Jewish texts but also about Western history, philosophy and literature—is extraordinary. 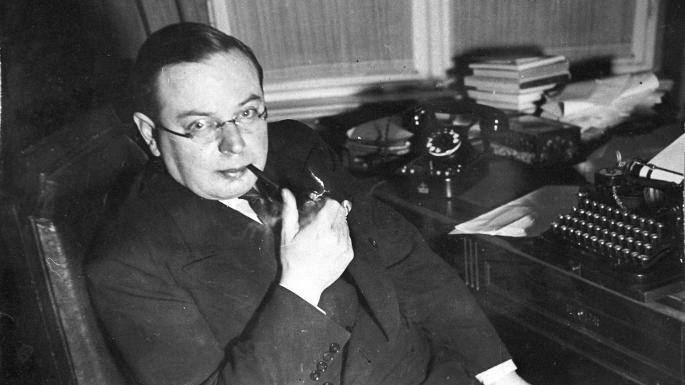 Once, sitting in a synagogue in London, I came across an essay in which he employed the African-American scholar Henry Louis Gates Jr’s work on Br’er Rabbit, the wily trickster from Southern folk tales, to understand the Biblical Jacob. I was amazed. How many Orthodox rabbis read African-American literary criticism? And even if they did, how many would dare use it to analyze one of the Patriarchs? Like many English-speaking Jews, I owe Sacks a debt. I daven from his siddur. I’ve led Seders from his Haggadah. He’s a wise and brilliant man. Which is why his recent essay declaring that, “Anti-Zionism is the new Anti-Semitism,” is so disappointing. In it, Sacks argues that anti-Semitism is “a virus that survives by mutating.” In every age, it latches on “to the highest source of authority available within the culture. In the Middle Ages, it was religion. In post-Enlightenment Europe it was science. Today it is human rights.” Thus, Sacks argues, today’s anti-Zionism—which on human rights grounds challenges not merely Israel’s policies, but its very existence as a Jewish state—is merely anti-Semitism in a new guise. It’s an elegant formulation. But there’s a problem. The claim that medieval Jews deserved blame for the murder of Christ, or that nineteenth century Jews were genetically inferior, had no rational basis. To believe it, you had to be an anti-Semite. It’s not irrational, however, to believe that Israel is seriously abusing Palestinian human rights. Anti-Semites may exploit those abuses to vilify Jews. But you don’t have to be anti-Semite to find them profoundly troubling. In the film The Gatekeepers, one former Shin Bet head, Avraham Shalom, says that in the West Bank, Israel has become “a brutal occupation force.” Another, Carmi Gillon, says “We are making the lives of millions unbearable.” There’s no place in Sacks’ historical schema for them. Sacks dismisses Israeli human rights abuses in one phrase: Israel is “the only fully functioning democracy in the Middle East with a free press and independent judiciary.” But in the West Bank, Israel is none of those things. The vast majority of people in the West Bank are Palestinians who cannot vote for the state that controls their lives. They are not citizens of the country in which they live. Their Jewish neighbors enjoy a free press and an independent judiciary. But West Bank Palestinians live under military law, which, among other things, forbids ten or more of them from gathering for a political purpose without prior approval from the Israeli military, even if they gather in someone’s home. In his essay, Sacks only mentions the word “Palestinians” once. But it’s impossible to understand contemporary anti-Zionism without them. Palestinians didn’t become anti-Zionists because they needed a rationale for hating Jews and found the old ones outdated. 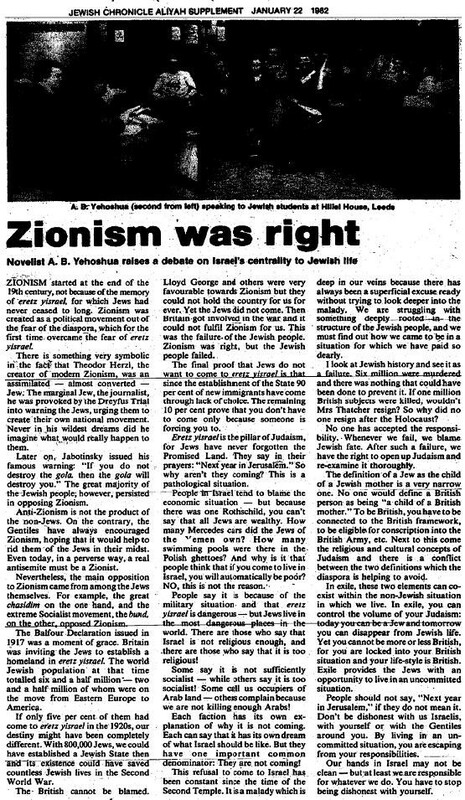 They become anti-Zionists because their experience with Zionism was extremely rough. In the early twentieth century, Palestinians constituted the vast majority of people in British mandatory Palestine. Like colonized peoples around the world, they began developing a national consciousness and a national movement aimed at securing their independence. As Jews began migrating to Palestine in large numbers, the Zionist movement—which sought a Jewish state—became an obstacle to their national desires. Yes, Palestinian nationalists made mistakes (for instance, their rejection of the 1947 partition plan) and committed crimes (for instance, the 1929 Hebron massacre). But you don’t have to consider Palestinians blameless to understand why they might view Zionism in a negative light. After all, it was a Zionist army that displaced roughly 700,000 Palestinians between 1947 and 1949 and would not let them return. 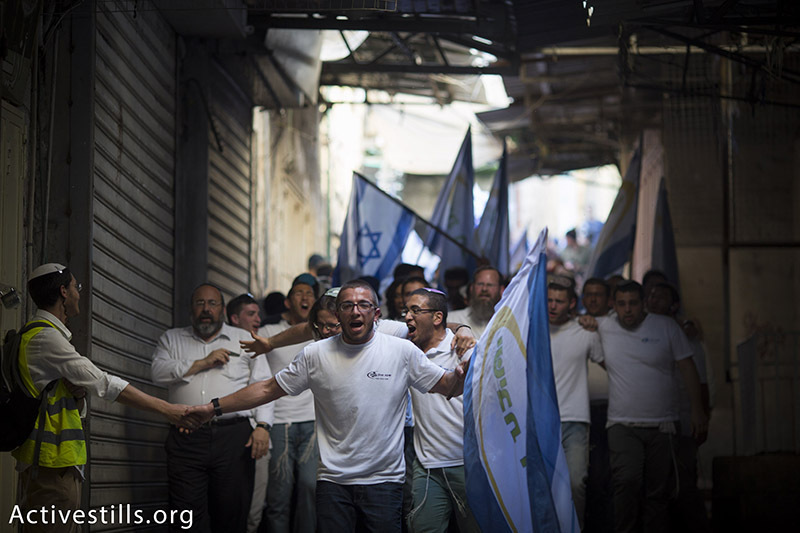 A Zionist army controls the Palestinians who live without basic rights in the West Bank. A Zionist army oversees Israel’s partial blockade of the Gaza Strip. Some Palestinians accept the two state solution on pragmatic grounds. But the vast, vast majority of Palestinians are anti-Zionist. Even most Palestinian citizens of Israel (often called “Arab Israelis”) vote for parties that seek to turn Israel into something other than a Jewish state. Yes, some anti-Zionists are anti-Semites. And yes, of course, some Palestinian anti-Zionists are anti-Semites. But equating anti-Zionism and anti-Semitism means claiming that virtually all Palestinians are anti-Semites, even Palestinians like Knesset Member Ayman Oudeh, whose political party, Hadash, includes Jews, or intellectuals like Ahmad Khalidi and commentators like Rula Jebreal, who have Jewish spouses. 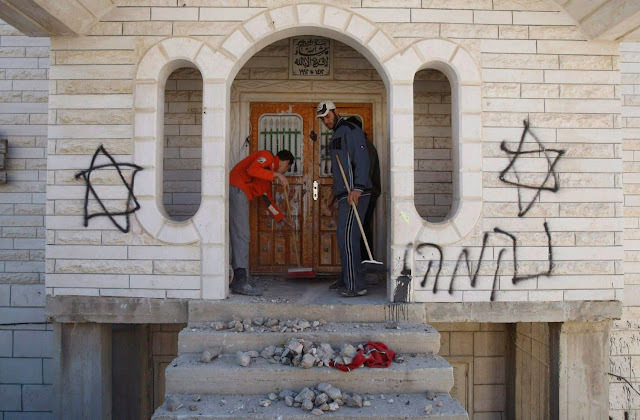 Equating anti-Zionism and anti-Semitism turns Palestinians into Amalekites. By denying that they might have any reason besides bigotry to dislike Zionism, it denies their historical experience and turns them into mere vessels for Jew-hatred. Thus, it does to Palestinians what anti-Semitism does to Jews. It dehumanizes them.